Imagine having a body of content-rich, dramatic literature that teaches your entire science curriculum. Now imagine that this material is sufficiently content rich that it requires little supplemental instruction, and that it is so entertaining that your students actually love performing it. An impossible dream? Welcome to the heART of Science! What began as the Muse Project – a collaboration between poet Brod Bagert and over three thousand U.S. classroom teachers – has culminated into a comprehensive collection of performance-based content-literature for each core discipline spanning grades K-12. The texts consist of all original Brod Bagert poems, dramatic monologues-dialogues, and plays. HOW DID THIS GET STARTED? Fifteen years ago Brod Bagert began toying with the notion of writing content poetry for the entire K-8 curriculum: science, history, math, etc. Longing for the kind of inspiration that only classroom teachers could provide, in March of 2012, he reached out to a select group of classroom teachers who responded with a tsunami of enthusiasm and a long list of topics for new poems. The Muse Project was born. The resulting material folds easily into either local or national core curriculum standards and lines up well alongside Standards and Benchmarks across the grades K-12 teaching spectrum. The first three books of the heART of Science series are now available on my website. 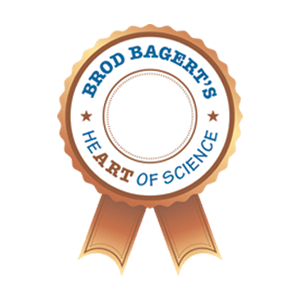 You can also learn more about the heART of Science series and the accompanying materials being developed for this series on the dedicated website for the project, www.brodbagertsheartofscience.com. Someone bit me! Oh the fear! Holy smoke, it’s dark in here! tearing, grinding, left and right. Oh no! I think I’m going down! This esophagus thing is a very tight space. It starts in a neck right under a face. that deep into a stomach goes. Feel the acid! Feel the burn! This stomach has begun to churn. I’m turning to liquid! I’m turning to gas! Digestion progression is terribly fast! through small intestine – loop-d-loop! I’m turning back to solid mass. and now I’m falling… falling… SPLASH! I’m floating in a big white well. Oh disgusting! What’s that smell? It’s what our bodies love to do – Turning cookies into poo. that three basic laws governed objects in motion. and for almost three centuries Newton was king. the laws of Sir Isaac are no longer right. So you see how our knowledge keeps inching along. It seems perfect today, but tomorrow it’s wrong. And who will be next to propose something new? First Newton… then Einstein… and next?… Maybe you.